The circle of budget smartphone makers have been increasing over the past few years. This brings us to the French OEM, Wiko, which you probably have not heard of. 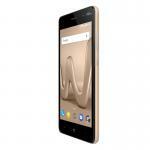 Wiko specializes in budget smartphones and the Wiko Lenny 4 is one of its recent budget offering. The smartphone comes with a decent stylish design that doesn’t easily give it away as a budget smartphone unlike the other plastic smartphones.